Reusable diaper covers make great cloth diaper gift set for baby girls or boys. Add vibrant and gender neutral colors to your baby shower registry. Place prefold or inserts to the diaper shell and secure layers under pocket flaps. Replace inserts every 2-3 hours. Reuse diaper cover if not soiled, wipe clean between uses and allow air-drying. Infant cloth diaper covers are available in One Size. Diaper shell is designed to truly grow with your child from newborn days to toddler-hood. 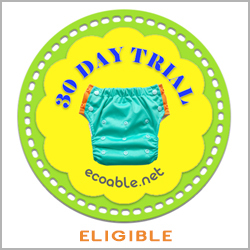 EcoAble Cloth Diapers are tested and certified in compliance with the US CPSIA (Consumer Product Safety Information Act) rules and regulations.